As a registered user at Silversands Online Casino, you can always benefit from their special promotions. For example, there are Weekly Promotions that will be emailed to you! And most importantly, just for signing up you can take advantage of their amazing R8888 deposit bonus. There are a number of new and ongoing promotions that are offered by Silversands Casino. For instance, there are Bonus Offers and Free Play promotions that are emailed to all registered users in addiiton to the weekly Newsletter that goes out every Friday, full of fabulous offers and bonuses. 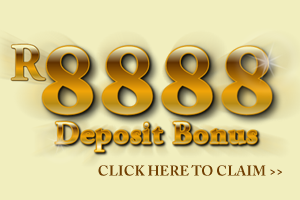 Don’t miss the R8888 Casino Signup Promotion! An incredible promotion offered by Silversands Casino is their famous R8888 where you are entitled to free chips worth R8,888. And you really do not need to do anything out of the ordinary for the promotion – or even pray that Lady Luck shines on you; merely registering on the casino will suffice since upon doing so, you will get coupons for the above amount which you can redeem and deposit to start playing the game of your choice. Making your first deposit of up to R1,888 using the code K3XTG entitles you to a 100% bonus on the amount you deposited. In the next instance, if you place your second deposit for up to R4,000 using the codeTD8FH you are entitled to a 75% bonus or up to R3, 000 on the amount you deposited. Finally, upon depositing a sum of up to R8,000 you are eligible for a 50% bonus on the amount you deposited. Simply use the code WWYMX. First you need to have the coupon code handy with you; you can copy it to the clipboard on your machine or simply remember it, maybe even make a note of it somewhere. Then the Install link guides you to installing the casino software on to your machine. On the home page of the casino, you will find this ‘Install’ link. There’s also the ‘Download Casino’ button that you can use. As soon as you have installed and registered you will pretty much be good to go once you login. After logging in, go to the ‘Cashier’ where you can redeem your coupons by going to the ‘Redeem Coupon’ tab, entering your coupon code, and then finally clicking on ‘Redeem’. Before you get down to redeeming your next coupon there must be a Zero or Nil balance on your account. There should also not be any withdrawals that are pending. Then, bear in mind that as far as minimum stipulations for placing bets go, they are set at 10x the bonuses received and deposits made. Also, placing bets on games like War, Pontoon, Craps, Baccarat, Craps or Roulette does not actually fulfil betting stipulations. Finally, bets placed on games like Video Poker or Blackjack are taken at 50 cents for every 1 Rand bet. There may be other applicable Terms and Conditions as well.